Three University of New Brunswick professors have been named Canada Research Chairs (CRC), reinforcing UNB’s presence as a research leader in Atlantic Canada. Dr. Karen Kidd, Dr. Scott Pavey and Dr. Bruce Balcom have each been awarded one of the prestigious research chairs, one of the nation’s highest research honours. “These are outstanding researchers and leaders in their fields – so clearly deserving of such high national recognition. Their pioneering work is a tremendous example of the impact the University of New Brunswick has – not only on the province but on the country and beyond,” said Dr. Eddy Campbell, president and vice-chancellor at UNB. Canada Research Chairholders are leading researchers in their areas and improve Canada’s depth of knowledge in the natural sciences, health sciences, humanities and social sciences. A total of 305 new and renewed Canada Research Chairs have been appointed at 53 postsecondary institutions across the country. The Honourable Kirsty Duncan, Minister of Science, made the announcement today while visiting The University of British Columbia. Today’s announcement represents a $260-million investment in the Canada Research Chairs Program. 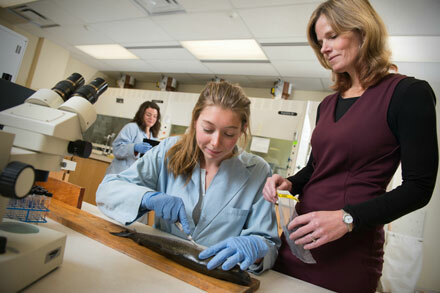 Dr. Karen Kidd was named the Tier 1 CRC in Chemical Contamination of Food Webs. Dr. Kidd’s research advances our understanding of how human activities are changing aquatic ecosystems and the effects chemicals have on aquatic life. Dr. Kidd uses novel approaches to examine contaminants in aquatic ecosystems from the Arctic to South America. Contamination from municipal and industrial discharges, resource development and food production continue to threaten the health and productivity of waterways across Canada and abroad, and her program identifies the aquatic systems and species at greatest risk. Consumption of contaminated fish is a serious issue, and fish contamination with mercury is a key concern across Canada and globally. It is the leading cause of fish-consumption advisories issued for thousands of lakes across North America. Dr. Kidd’s research is tracking mercury and other contaminants across our lakes and rivers, assessing impacts and advising governments. As the CRC in Chemical Contamination of Food Webs in the Canadian Rivers Institute and biology department at UNB, Dr. Kidd’s program is providing much-needed information to ensure that our waters are healthy and sustained. She will continue to conduct high impact, internationally recognized research on aquatic food webs with the goal to generate new knowledge to better understand the relative sensitivities of ecosystems to contaminants, and to ultimately manage the risks to the aquatic environment. Dr. Scott Pavey was named the Tier 2 CRC in Aquatic Molecular Ecology and Ecological Genomics. Dr. Pavey’s research involves understanding how the genetic diversity in fish populations and species results in traits important to both adaption in nature and human user groups. Dr. Pavey uses state-of-the-art technologies and techniques to address questions in conservation, fisheries management, evolution and ecology with the aim of conserving the natural diversity. 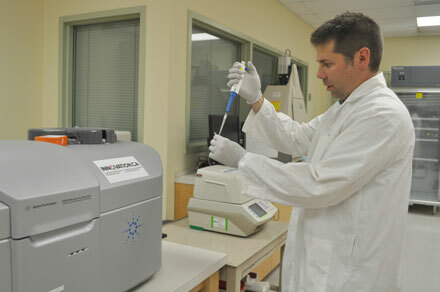 By using the latest sequencing technology to consider entire genomes of fish species, Dr. Pavey can determine the key genes for traits important to adaptation in nature and to human stakeholders like fishermen, aquaculture workers and those concerned about fish conservation. In so doing, Dr. Pavey can make recommendations about how to protect the most important populations of species and help make aquaculture more sustainable. Dr. Bruce J. Balcom was named the returning Tier 1 CRC in Materials Science Magnetic Resonance Imaging. Dr. Balcom’s research applies new methods of Magnetic Resonance Imaging (MRI) to a broad array of problems in materials science, helping to improve and develop a new materials research capability in Canada and facilitate the introduction and development of new processes and products. For the first 30 years after the discovery of MRI, it was generally believed that most solids and gases could not be imaged using this method. Dr. Balcom proved this assertion wrong, having invented a series of MRI techniques that permit unrivalled and unprecedented visualization of a very large range of materials systems. Dr. Balcom’s CRC aims to continue his work on three principal goals: to permit rapid and continued development of the material science imaging techniques pioneered at UNB, to permit the earliest and most advantageous application of these techniques by their collaborators, and to provide national leadership in the technology and applications of materials science MRI. The Canada Research Chairs (CRC) program has stood at the centre of a national strategy to make Canada one of the world’s top countries in research and development since 2000. The CRC program invests approximately $265 million per year to attract and retain some of the world’s most accomplished and promising minds. Canadian universities both nominate Canada Research Chairs and administer their funds.